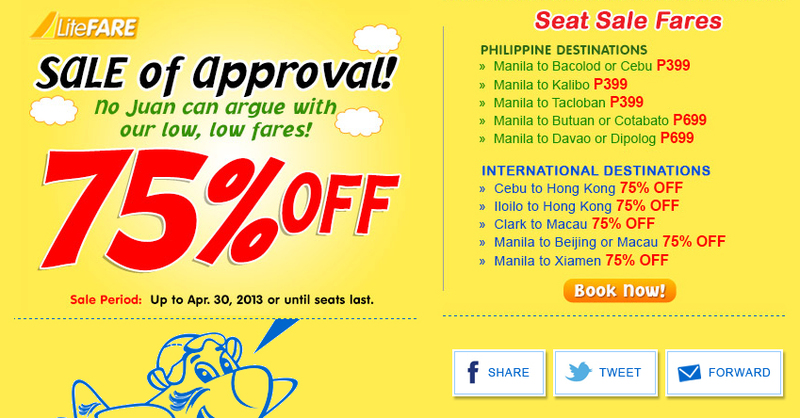 You might want to check out this latest promo of Cebu Pacific Air. This entry was posted in Travel/Airfare promo and tagged cebu pacific seat sale, cebupac promo, seat sale promo on April 28, 2013 by Yami. Going out in the scorching heat of the sun is not advisable health-wise, but two Saturdays ago the family was blessed with a partly cloudy skies that we were able to go out and visit Fort Santiago. We’ve been planning to visit this place for the longest time. It was only realized last April 13. The Cathedral-Basilica of the Immaculate Conception or Manila Cathedral is one of the oldest churches in Manila. Have a Kalesa trip via this horse-drawn carriage (right photo) in Intramuros. We were like tourists visiting the place for the first time. While I was busy taking some pictures on our way to Fort Santiago, hubby was explaining something to the kids about the Manila Cathedral. The kids don’t want to have their photographs taken with these life-size cardboard standees (left photo), so it’s just me and hubby. 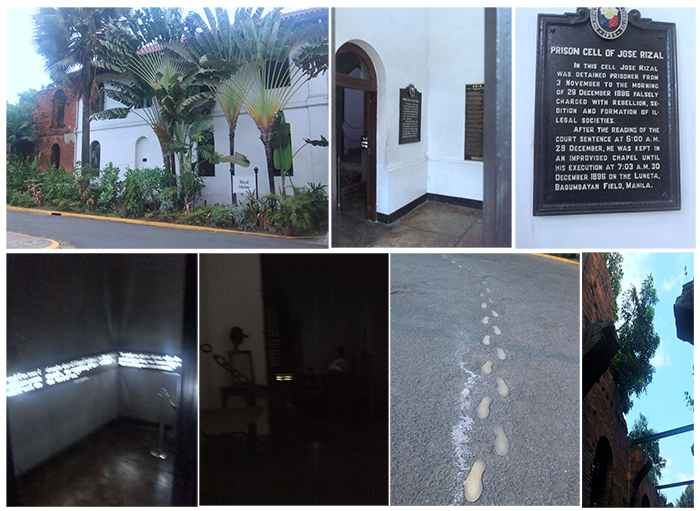 Dr. Jose Rizal spend his last few days inside this cell before his execution in Dec. 30, 1896. His “last footsteps” were immortalized through these bronze footprints. 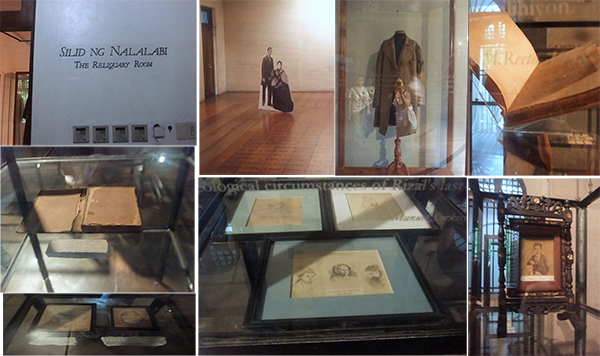 Inside the shrine is a museum where Jose Rizal memorabilia are found. The memorial cross represents the demise of a total of 600 Filipinos inside Fort Santiago during the Second World War. The dungeon served as execution chamber of political prisoners from Spanish to Japanese period. 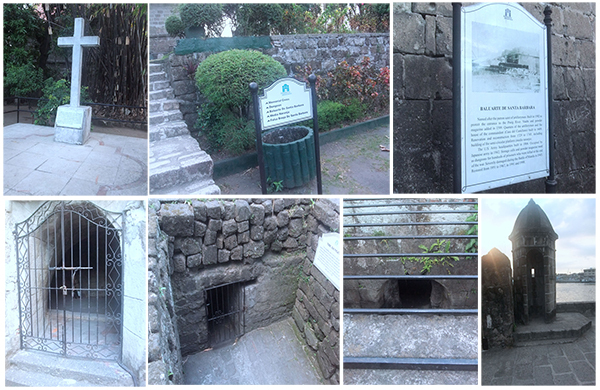 Bombs and cannon at Fort Santiago. The tranvia is a replica of the pre-war street cars in Manila. I would not trade the smile and laughter that the family shared while we were at the park. We went home tired, but brought with us an experience that we will always cherish. 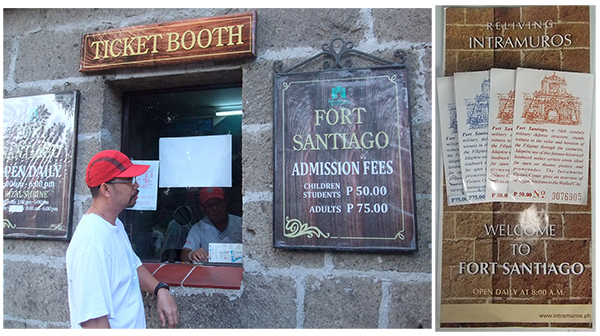 Fort Santiago is located at Plaza San Luiz Complex, Cor. Real and General Luna Sts. 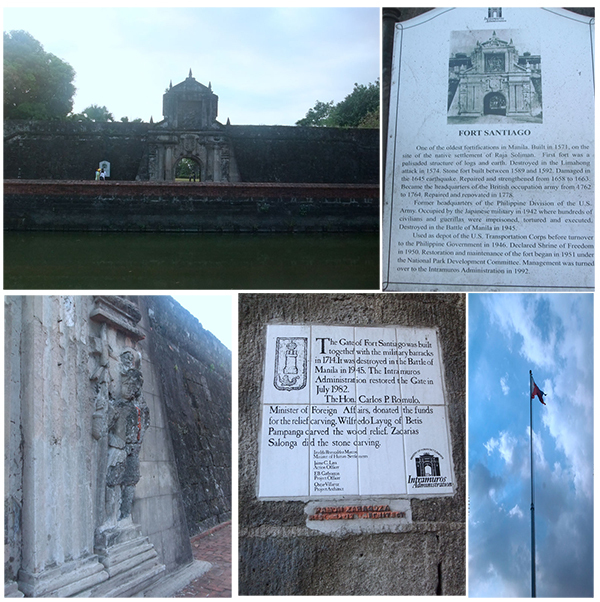 This entry was posted in Churches, Family, Parks, Personal, Photography, Places to visit, Tourists destination and tagged church, Fort Santiago, historical site, Manila Cathedral, National Shrine on April 21, 2013 by Yami.